The staggering growth in the numbers of people who believe in New Age spiritualities and paranormal phenomena – combined with America’s pervasive mania for diets, food fads, and exotic cure-alls – draws millions each year to answer the siren song of unorthodox nutrition practices. Usually based on supernatural underpinnings or the pronouncements of charismatic gurus, these diet regimes often fly in the face of well-grounded, scientific dietetics. 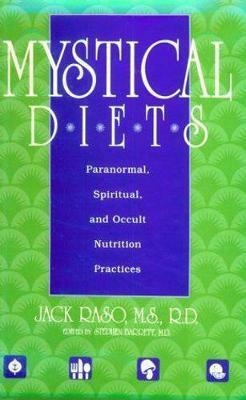 In writing Mystical Diets, author Jack Raso, trained in scientific reasoning and a registered dietitian, offers an accessible yet authoritative tool to assist laypersons and health professionals in making sound decisions regarding the appropriateness (or inappropriateness) of a number of fringe nutritional programs. With Mr. Raso’s help, these decisions can now be based not only on standards of scientific validity but the likelihood of subjective benefits as well. Mystical Diets details the history, philosophy, and manifestations of macrobiotics, Natural Hygiene, the Edgar Cayce tradition, Ayurvedic medicine, Anthroposophical medicine, the Gerson Therapy, the Matol movement, and much more. Through the generous use of quotations, proponents of the various alternative-nutrition systems, past and present, are allowed to speak for themselves. And the author’s thorough discussion of the most up-to-date research into health and diet helps readers make up their own minds about foods, herbs, vitamins, minerals, and the claims made by proponents of alternative dietetics.